Married: Eliza Womack in 1796; she died about 1806. My grandfather and all my relatives were democrats. My grandfather was first cousin of Andrew Jackson, and it seemed to him like family treason to be anything but a Jackson democrat; but they were all anti-slavery in their opinions . . . ."
John R. McBride in Overland to Oregon: Yamhill County, page 73. For additional documentation on this disputed point, see History of the Pacific Northwest: Oregon and Washington, by Elwood Evans. 2 volumes [ Portland, OR: North Pacific History Co., 1889], 2:445-447). Search on the page for "Crawford"
Thomas married Eliza Womack in 1796, the same year that Tennessee became a state. For further on Eliza Womack, see the Womack genealogy, Page 16, Item 6. McBride was a highly respected frontier preacher with ties to Barton W. Stone and reformer John Mulkey of Kentucky. We can locate Thomas McBride as a messenger of the Roaring River Baptist Church in Overton County, Tennessee in 1801. He would have been 24 years old. The History of Overton County is on line. Look under History for Thomas McBride's name. Because of its spelling, a search tool may not find it. Thomas McBride followed the lead of John Mulkey (influenced by Stone) in leaving the Baptist Movement about 1810. He taught that those who obey the Lord become just Christians and are not part of any denomination. This was years before Alexander Campbell came to that view. McBride preached in what became White County, Tennessee, then moved his family on to Missouri in 1814 or 1815. His wife Eliza may have died and Thomas married Nancy before Margaret was born in 1809. Nancy's last name before marriage remains a mystery. The church was founded in late 1816 with eight members. A building was erected, and it was dedicated on November 22, 1817. The original building was 16' x 24', made with unhewn logs and chinked with mud. It had two chimneys. This is in Howard County, about eight miles south and then west from Fayette, Missouri (where J.W. McGarvey lived after being graduated from Bethany). Alexander Campbell visited in the area and stayed with a Brother Carson, eight miles south of Fayette. The congregation was first called the Salt Creek Christian Church, but eventually became known as Ashland Christian Church because of the many ash trees in the area. The building was replaced with a frame structure in 1849. One record says he was the first preacher (1822) in the Rocky Fork Township. He was a "an earnest, zealous one, whose textbook was the Bible alone." Thomas C. McBride was preaching the plan of the New Testament Church here years before the Disciples Movement came to Missouri. The state of Missouri lay in the path of emigration to the west and was among the first to receive visits from Christian preachers from Kentucky. Thomas McBride came under the teaching of B. W. Stone in Kentucky, moved to Missouri in 1816, and was the first Christian preacher who crossed the Mississippi River to preach the Bible alone as the basis of Christian union. He preached and established churches in Howard, Boone, Franklin and other adjacent counties lying along the Missouri River. Samuel Rogers was the second Christian preacher to go to Missouri. He made his first journey in 1819 and found many churches already established by McBride. Mr. Gates original remarks are online. He was a tall, fine looking man of splendid appearance. I know nothing of his peculiarities as a preacher, but he must have been a man of rare powers to impress himself as he did upon all the preachers and churches in a early day. Researcher Jim Morgan located Thomas Crawford McBride's name at the top of the membership list for the Lone Jack Church of Christ, Lone Jack, Jackson County, Missouri. He became a member in 1840. Actually, it appears that he established the congregation. He was "dismissed" in 1842. This merely means that he left the congregation to work elsewhere. The good cause of our Redeemer is still on the onward march in this Western Country. The brethren have just closed a protracted meeting at Dover, ten miles from this place where forty-four made the good confession and were buried with the Lord in baptism. Some five or six of the number were from the Presbyterian ranks, and one from the Methodists, and seven by letter, making in all fifty-one. The preaching brethren were father McBride (that old pioneer in the good Cause in Upper Missouri,) and T N. Gaines. . . .
Millennial Harbinger, 1842, page 476. But soon after the wagons of his son James McBride left for Oregon in 1846, Nancy McBride fell sick and died, leaving Thomas with dimming vision and without a mate. Many of his children and grandchildren were gone and the others were making plans to go. He would soon be alone. The decision was made. He would find his loved ones in Oregon! Approaching 70, T. C. McBride set off on horseback with Andrew and Ellen Wright, their son James and Elisha Bedwell to reach Eden. They rode horseback the 2,000 miles in 41 days, bringing only what they could with two pack horses. They slept on the ground at night without shelter. It was September 13, 1847 when the weary travelers arrived at the James McBride residence west of what was to become Carlton. Stephenie Flora lists Elisha Bedwell as among the travelers of 1847. Early in September after a day of rain, which had mistened the parched earth and cleared the skies of autumn haze, a little party of five on horseback, with one or two pack animals, rode around the point of the lofty hill which fronted our house. My father was absent, but the family were at their usual duties. I was engaged under my mother�s instructions in digging a small channel that would lead a stream of water that flowed from a spring through a little piece of ground devoted to a vegetable garden. We saw that the party were travelers, and that they had dismounted at the house. My mother hurried over the few yards between where we were and the door, and I followed full of curiosity. My elder sister had brought seats before we arrived, and there seated quietly was my grandfather, Thos. and two others, both of whom I recognized, and one woman and a little boy about two years old. One of the men was the husband of a cousin of mine, the other a man from the same county in Missouri, and his wife and little boy. Without one word of their having even contemplated the journey, or having started from their Missouri home, they had thus suddenly come upon us. My grandfather was then 70 years of age, and his hair was white as winter�s snow. He looked wearied from his long travel of 2,000 miles, and he had ridden for 41 days continuously on horseback, sleeping in his blankets on the ground at night without shelter, to find us. The party had left the train at Ft. Hall, on Snake river, in the month of August, and reached our home on the 13th of September. The lady, Mrs. Ellen Wright, had performed the same feat while her husband and herself, seating the little boy on a pillow in front of them, had by turns carried him all that long distance. It was of such stuff that the early pioneer was made. When we left Missouri the year before, my father�s mother was living, and his brother and sister were domiciled in good homes, with not a suggestion that any of them contemplated any change, much less that which involved the long journey to Oregon. But before they had heard from my father�s experiment they had all been seized with a desire to �go west,� and all followed by the next year�s train. north to Stout (lane) at top of hill. My father�s mother had died a few months after our departure the year before. My uncle, Caleb Woods, and my father's brother, Dr. Thomas McBride, two of my cousins, by the name of Davis, and their brother-in-law, Elisha Bedwell, were of the party, and the latter had accompanied my grandfather on his horseback journey in advance of the train. It is characteristic of all the old frontier people that what they did they did promptly, and so without warning or suspicion of their coming, they had arrived in our midst. From Overland to Oregon: Yamhill County, 1846 by John Rodgers McBride. Available in the McMinnville, Oregon Library. The grandson just quoted matured to become a U. S. Representative from Oregon. The elder sister referred to later became the wife of Sebastian Adams, the founder of McMinnville College. 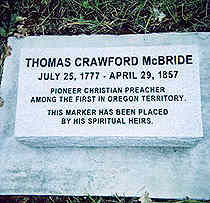 The Lord granted Thomas C. McBride ten more years to preach and farm his 393 acres in Oregon. He married 55 year-old Mrs. Margaret Ann Wright of in the twilight of life. Following his death in 1857, Ann lived with James and Mahala McBride. This is based on the 1860 census. Wright family researcher Charles Chicks reports that Ann married Elijah Barton Davidson in 1864 and died at McMinnville. Most historical accounts list her as Margaret McBride Davidson. On his 77th birthday, July 25, 1854, Thomas Crawford McBride was preaching in a gospel meeting in Hillsboro with his son and Harrison H. Hendrix. There were four additions to the church. The sight of his venerable father in the pulpit led (James) McBride to observe: "My father has been preaching fifty-nine years (this is the sixtieth). He abandoned all human creeds in 1810 . . . and has been pleading the Bible alone doctrine ever since; and though too blind to read, he still preaches." -- Christians On The Oregon Trail, Second Edition, page 197. Three years later his earthly labors were over. The prince of pioneer proclaimers had passed on. Now he could see the Lord that he had extolled for more than 60 years. T. C. McBride's grave marker. Tammy Lewis located Thomas Crawford McBride's obscure and broken grave stone in the McBride Cemetery west of Carlton, Oregon. A tour group, led by Jerry Rushford and this scribe, had the headstone replaced. The new one is impervious to being damaged by mowing equipment, yet modest in cost and appearance. Thomas McBride was among the first buried in the cemetery that bears his name because it was established in 1857, the year of his death. 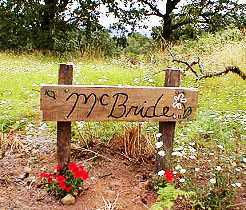 Other relatives without the McBride name are buried there including Lavina Davis, the fourth child of T. C. McBride and Eliza Womack. Those turning off of McBride Cemetery Road to drive back to the cemetery proper should notice the narrow gauge rail that forms the gate. It has a 2.5 inch working surface and is 4.25 inches from the working surface to the bottom where a standard rail may be six inches to the ground with a three inch working surface. The first trains in the area were of the narrow-gauge variety. The rails were 30 inches apart rather than the standard 56 1/2 inches. Jim Schmauder of Dayton says he can remember the gate being constructed by the Oberg brothers in the late 1960s. Thomas Crawford McBride had a son also named Thomas Crawford McBride. He had met Martha Ann Brink when his father was preaching at Rock Fort Township. They married in 1835 and came overland in 1847, the same year that Thomas, Sr. left Missouri. Evidence is good that they left for Oregon at the same time. Like his older brother James, young Thomas was a physician as well as a preacher. He and Martha had settled on land several miles directly south of present-day Perrydale in Polk County. The nearest church would have been Bethel, about four miles northeast. But tragedy struck less than a year after reaching Oregon. Thomas had been preaching on the east side of the Willamette River and was returning home with a yoke of oxen. Night had fallen before he reached the ferry at Oregon City. When the ferry boat started to move, the oxen were frightened and gored McBride's horse, causing horse and rider to fall into the Willamette River. He drowned leaving Martha with five children and another on the way. Census taker's entry in the 1850 Census. Lavina, 11, named for her aunt Lavina McBride Davis. Elizabeth, 9, named for both grandmothers. Nancy, 7, named for her step-grandmother. Mary, 5, possibly named for her paternal g-grandmother. Thomas, 2, named for his late father and grandfather. The 1850 census shows widowed Martha Ann McBride and her children living with her father-in-law, Thomas Crawford McBride, in Yamhill County. That same year, she married John Bird Bounds. He brought 10 children to the marriage and Martha Ann brought six. They settled on his farm at Buena Vista. A family genealogy shows John Bird Bounds first marriage, but not his second to Martha Ann McBride. The reader may want to read our entry on Buena Vista. The McBride farmhouse must have been quiet after Martha's family of seven left. Perhaps that's why he decided to marry Ann Wright the next year. Thomas Crawford McBride's obituary appeared in the Oregon Argus where it was no doubt written by W. L. Adams, his friend for at least 10 years. The obituary was reprinted in the Millennial Harbinger of 1857, page 599. Died, of old age, at his residence in Yamhill county, Oregon, on Wednesday, April 29th, 1857, Thomas Crawford McBride aged eighty years and three months. The deceased was born in Virginia in 1777, and emigrated to Oregon from Missouri in 1847. He became a preacher of the gospel in the Baptist church at an early age, in which capacity he labored zealously until his union with the Christian or Disciple church, after which he labored, as a devoted and untiring minister up to a few years before his death, when he was incapacitated for preaching on account of his feebleness. During his lifetime he was emphatically of that class of men who make it the great business of life to lay up treasures where neither moth nor rust corrupt, nor thieves break through and steal. His precepts were always enforced by his own example, and his long life was marked by a series of blameless acts that made up a Christian character such as seldom attaches to men in the flesh, and it is doubtful whether he had an enemy living. He departed calmly and tranquilly, as an infant gently falls to sleep; and as the sun of his natural life went down in full orbed splendor, the great Sun of Righteousness threw a rainbow of glory over his tomb, on which his dim eye rested, and lighted up with lustre as it read, "There remaineth a rest for the people of God." He leaves large circles of friends in Virginia, Tennessee, Missouri, and Oregon, all of whom feel a pang at the news of his departure, but none of whom are warranted in sorrowing as those who have no hope. � Oregon Argus. T. C. McBride's will is now available. Follow this link. Christians on the Oregon Trail by Jerry Rushford, 1997. College Press, Joplin, Missouri. |      |      |      |      Eunice Mahala "Emma"
|      |      |      |      Willis B. Morse Dr.